Last year about this time my mother took some pictures of the sour beers I had aging in my old room, this year she did it again. In the photo above are the three sour beers I have aging in my parents' closet. From left to right you can see my Flanders Pale Ale (half of which will be bottled in August with the other half getting some fruit, probably Pluots ala Russian River Compunction), my Cable Car clone (my mother is graciously cleaning the airlock shortly), and my Lambic (which is going on two years old and will be partially bottled in August and have the rest blended with some fruit and give a few more months of age). 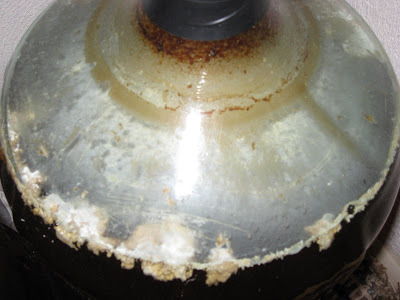 The photo below is a closeup on the pellicle reforming on the Lambic. You can see the bigger chunks that are remnants of the old pellicle which fell which I was transferring the carboy from one room to another. Yeah, it looks delicious in that "man is that gross" sort of way. 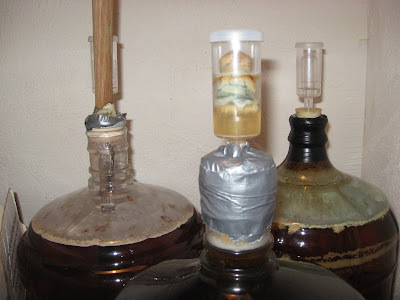 The pellicle will reform if there are still fermentables for the yeast and bacteria to eat. I am amazed that it has been fermenting since August 2006. What are the gravities of each of these or are we well past that? Not sure about the gravity on these, I haven't trained my parent's to take hydrometer readings... yet. I'll be blending and tasting in a few months, expect a full report then. So what's the attraction to aged beer? Me and Trav brewed up your Mad Elf clone and it came out quite nice, but a few months later it was smooth but seemingly past it's prime. I enjoyed it (probably too much) for about two months after I brewed it, but then the obvious cherry flavor had mellowed into a general fruitiness. Glad to hear the Mad Elf clone turned out well. Fruit flavors do fade with time, but as they fade often they will better meld into the beer, becoming more of a complexity than an up front flavor. If you have any bottles left save a couple for next winter and see how it changes. How long a beer is “good” for all depends on the type of beer, your taste in beers, and your procedures. When I brew something delicate or hoppy (Pils, Kolsch, IPA, Bitter, Wit etc..) I generally try to consume it as rapidly as possible. No matter what you do these beers will go down hill quickly and end up tasting unleasant. However bigger malt focused styles (Barleywines, Imperial Stouts,Wee Heavies, Doppelbocks etc…) will continue changing and improving for years if you keep oxygen contact to a minimum throughout the brewing/fermentation/bottling process and store them in the right conditions (dark, cool). Sour beers are different. The microbes that ferment them take on the order of months and years to slowly do their job. In the meantime they pump out all sorts of intermediate compounds, sometimes tasty and sometime unpleasant. When you store a sour beer in an oxygen permeable container it helps to flush some of the volatile compounds out of the beer and give the microbes that like oxygen a boost. I find sour/funky beers to be the most complex and interesting, there are flavors that they have that you won’t get from anything else.